Manila, Philippines - It was a tough battle for Team Bamboo in the much-awaited episode of best vocal competition on ABS-CBN, 'The Voice Kids' Philippines on Sunday, July 6, 2014 as the rock icon became emotional picking his Final 2 artists for the live semi-finals of the competition. "I'm getting emotional. I really love these kids, man!," Coach Bamboo said while in tears. Team Bamboo's young artists Juan Karlos Labajo ("Stay") and Edray Teodoro ("Tulak ng Bibig") were chosen to advance in the Live shows. Other artists who advanced to the Sing-offs are Stacy Pineda ("Payphone"), Gem Capalad ("Iingatan Ka"), Nathan Bautista ("It's My Life") and Borge Rivera ("Scared To Death"). Coach Sarah picked Edray and Gem when asked which artists have stand-out in the Sing-offs. 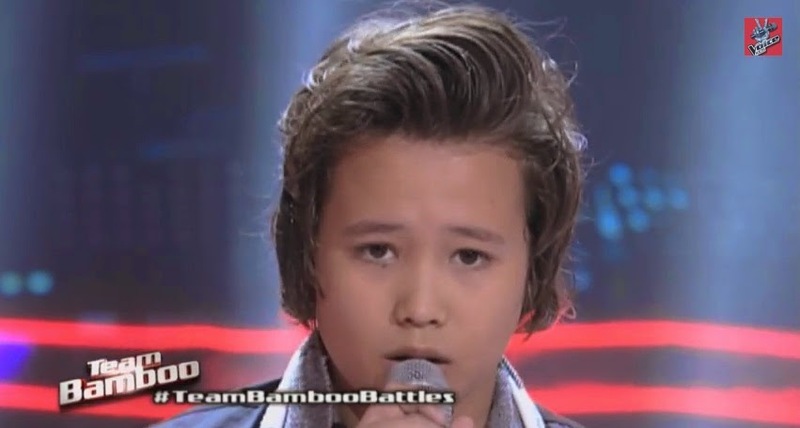 Meanwhile, Coach Lea chose Juan Karlos. The episode of The Battles on Sunday dominates online conversations with '#TeamBambooBattles', 'Go Zack', 'Edray', 'Grazz', 'Go Natsumi' and 'Go Juan Karlos' among the trending topics.